Come morning, I felt really good, and my temperature was down to 99.4F-- very slightly high for me, but nothing of concern. I went up on deck to get a bit of fresh air, then returned to the cabin for breakfast in bed. I then returned to the deck for sightseeing and pictures. While there, I ran into some of our tourmates and found out that Brenda was sick, as was Warren, although he was still up and active. So I'm Patient Zero for the tour group. Great. After a visit to the ship's doctor, who prescribed me more herbal medicine tea (and it seems to be doing an excellent job on my illness, I'm pleased to report) and gave me a shiatsu massage (less effective), I went up on deck to experience the gorges a little more directly. Even on deck, with the air on my face and the terrain a little more real, somehow, than when I saw it through my cabin window, I was still having scale problems. The size of the cliffs and peaks is so far beyond anything I'd ever seen, I kept being struck by sudden realizations. "Those aren't bushes on those mountains," I'd realize, "they're pine trees, and big ones at that. Wow..." At one point, I spotted a small white dot moving on a slope. A bird, perhaps? No. It was a mountain goat. Just amazing. There is so much beauty here. 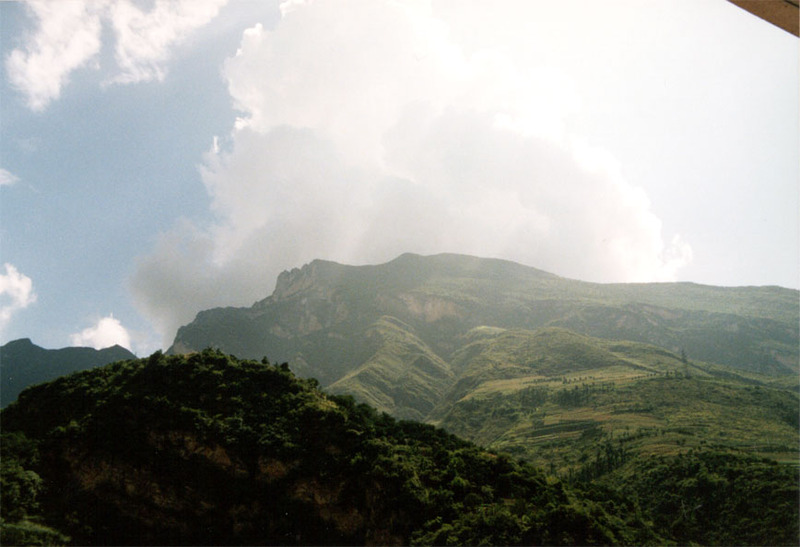 Often, mountain peaks are shrouded in clouds, while we enjoy sunshine. Other times, the clouds seem to be anchored to the peaks and stretch across the sky-- I call these "banner-clouds." As we passed yet another enormous mountain, I watched a cloud bank spill over its summit and almost flow down the slope toward us, tendrils of vapor curling and twisting as though surprised, caught by the sun and made pure white against the deep blue sky. I could spend months here and never grow tired of looking. 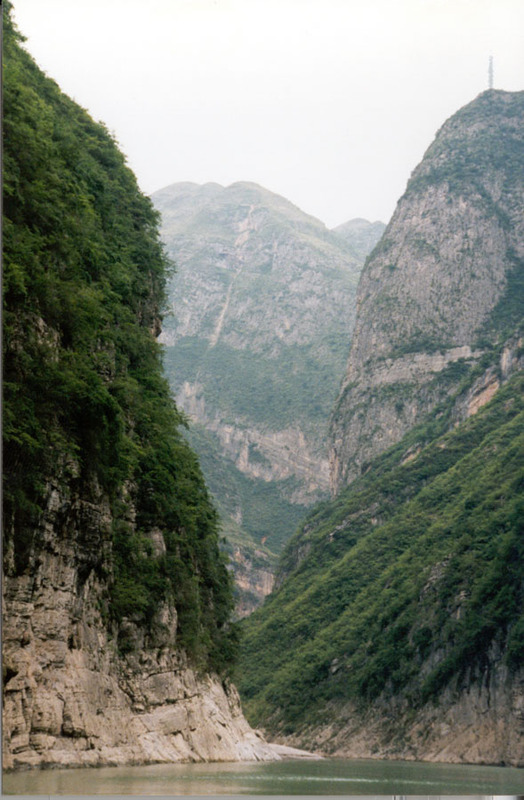 According to the narrator on deck, the Gorges were used as strongholds by the Chinese during World War II. He pointed out a few caverns in the cliff faces which had actually been anti-aircraft emplacements. Since the Yangtze is such a vital shipping and travel artery, the Japanese would make strafing runs on ship on the river. The AA guns were there to discourage the Japanese, but since strafing requires low-level flying, the guns would fire down into the gorge. I can just imagine it, actually, although it must have seemed strange to everyone actually involved. AA guns pointing downward? Even in an activity as chaotic as war, that seems particularly wrong, somehow. After lunch, we boarded small motorized sampans for a trip up the Daning River to sail through the "Lesser Three Gorges." These sampans are boats big enough to seat about thirty, with retractable roofs over the seating area. Behind that is the engine room, and in front is a narrow prow with two benches. This is where the crew sits, using flags to indicate to other boats the side on which they intend to pass. 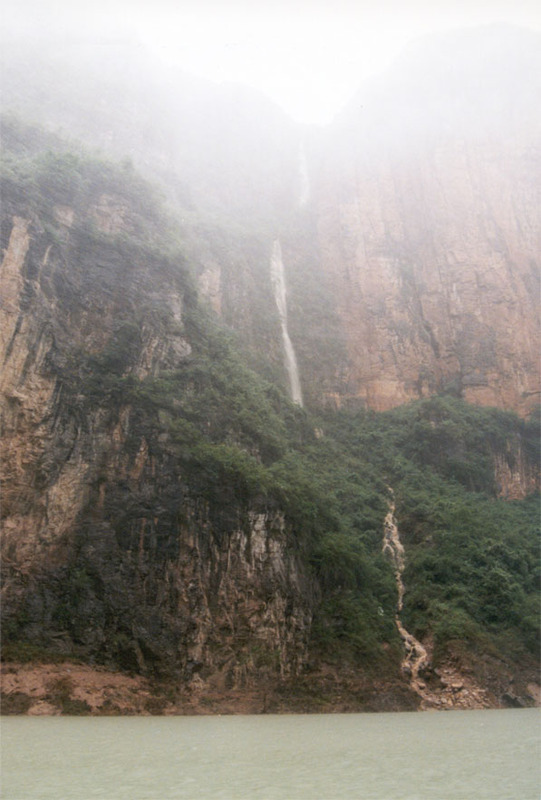 The Lesser Gorges were nothing short of spectacular, with sheer cliff faces rising straight out of the river to stand several hundred meters tall. At least one peak had to be more than a kilometer above us. We also had pointed out a number of cliff trails, which are no more than wooden poles driven into the cliff faces, thereby forming a road of sorts. When the cliff face is almost literally vertical, there isn't much else one can do, I suppose. They still looked terrifying. We also saw some graves on the cliff face. At some point, people had buried their dead by placing them in coffins, and then placing the coffins in small notches in the cliff face, a couple of hundred meters above the water. I can't figure out how anyone got the coffins up there, to be honest. The notches were barely visible, let alone the coffins they sheltered. Partway up the river, our sampan's engine began making some alarming noises, so we grounded on a nearby gravel spit and everyone went ashore while the crew attacked the engine with hammers (that's what it sounded like, anyway). In no time flat, a dozen or so locals materialized with the usual assortment of stuff for sale. I studiously ignored them until one guy offered me a fossilized trilobite-- a genuine article, too, so far as I could tell. I ended up buying it, plus a larger piece containing multiple fossils. We made it as far as the entrance to the Emerald Gorge before turning back. 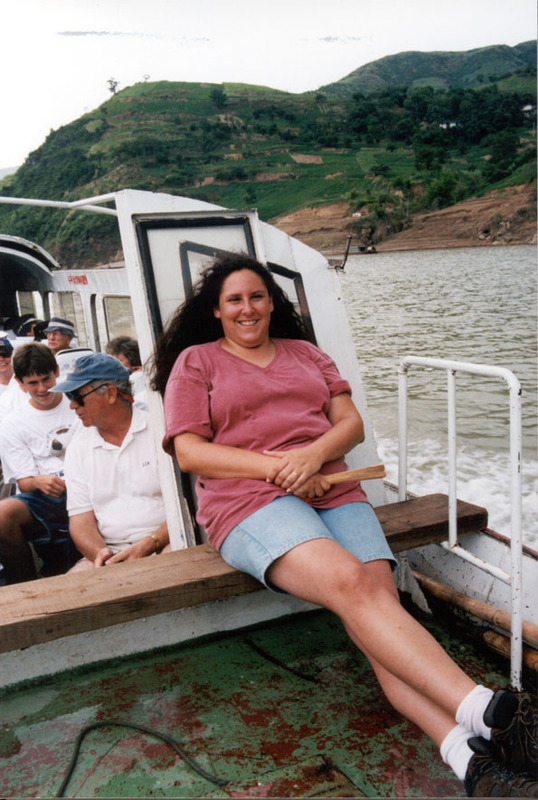 As we headed downstream, Kat and I decided to sit up on the prow of the sampan, outside the sitting area. While there, one of the crew pointed out some wild monkeys on a cliff face. I snapped a picture and heard, to my dismay, the film rewinding. I'd shot the roll, and just then we saw another monkey with a young one clinging to its back! I swore a lot, reloaded film as fast as I could, and missed them completely. Arrgh! About ten minutes later, the light rain we'd been experiencing started to get heavier, and the wind really picked up. The crew insisted that we return to the seats under the roof, and by then, the rain was heavy enough that we were happy to comply. Very shortly, we found ourselves caught in a serious summer storm; the gorge magnified the wind, naturally, but by the same token probably sheltered us from the occasional lightning bolt. We almost lost the sampan roof twice, and the second time he wind pulled it out of its track such that the crew had to take quick action to secure it. On the brighter side, the downpour produced a great many temporary waterfalls on both banks, some of them fairly large. And just as we returned to our ship, the rain dried up and the sun started to show itself once more. The nearby peaks were girded with more banner-clouds and touched by the light of the sunset, so of course I ran up top and started shooting picture after picture, ignoring my worsening sore throat. I was really hoping for a rainbow, but no such luck; even so, I think I got some great pictures. Kat finally found me and marched me to our cabin, where she poured more medicine down my throat in preparation for dinner. Once there, however, I felt quite ill-- it was all I could do to have some soup. I excused myself, got back to the cabin, avoided throwing up, took my temperature (101.3F), and crawled into bed. Maybe the sampan trip was a bit too much, after all. It was worth it.